If you want to know How to Brush your Dogs Teeth and Why you should brush, search no further! No matter what your dog’s size or personality is like, it is important to brush! Especially if you have an Italian Greyhound, failure to do so can mean cavities, gingivitis, plaque build up, periodontal disease, loose teeth, swollen gums, proliferating gum disease, bad breath and abscess – among other things. Doctors attribute most bad doggy breath to poor dental hygiene so if your furry friend had a foul odor coming from his mouth, be sure to start right away! Most Italian Greyhound will begin to need teeth pulled by the age of three if regular teeth brushing is not part of their daily routine (so please, brush for them). It is recommended to brush at least twice a week. Starting a regime when you get your pooch will ensure he or she will grow accustom to this weekly activity. To increase good dental health for your pet it is recommended to have your dog on chew hard dry food, eat dog bones or hard toys regularly, and use dental dog products like Greenies. Toothpaste: Human toothpaste is not edible and dogs will swallow whatever you use to clean their teeth so you cannot use human toothpaste so be sure to pickup something made for dogs. They come in all treat flavors so pick something out your dog will enjoy! Toothbrush: you can use a human toothbrush but it is recommended you get something smaller – especially the smaller breeds like Italian Greyhounds. A nubby-surfaced rubber cap, a wash cloth or a piece of gauze wrapped around your finger will do as well. Position yourself and your dog so that you can access the dog’s teeth comfortably. To get them accustom to brushing their teeth, massage their lips for 30-60 seconds a few times a week for a few weeks with your finger. After that, introduce the toothpaste but putting it on their lips. When they feel comfortable get to work with the tooth brush and toothpaste by lifting your dog’s upper lips and begin to brush in a circular motion, much like you would brush your own teeth. Be sure to brush where the tooth meets the gum-line. Don’t forget to get the very back teeth, since this is where your dog is most likely to develop problems. When you are finished the top, move on to the bottom and repeat! 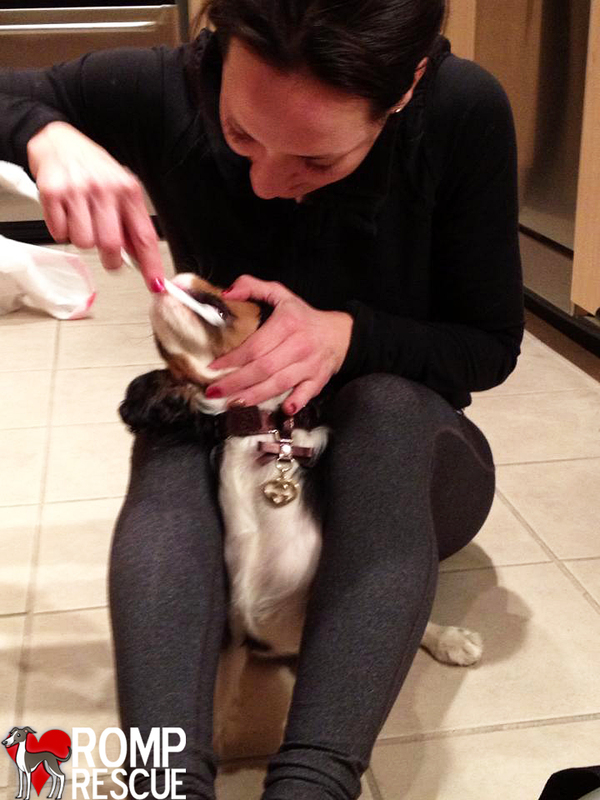 To ensure they see this as a positive experience, reward them after they get their teeth brushed! You might think that a teeth cleaning at the vet is the solution. If you see significant tarter buildup you should seek a cleaning for your pooch but realize that they put most dogs under when they get their teeth cleaned. As dogs get older, using anesthesia becomes more risky so please do your best to brush their teeth weekly! ROMP Italian Greyhound Rescue specializes in Italian Greyhounds, this breeds teeth are particular prone to dental problems. Italian Greyhounds have small mouths with relatively large teeth and they can’t open their mouth as wide as other breeds. When they eat, food tends to get caught in the back of their mouth where it can cause problems for their teeth if not properly taken care of on a routine basis. They also don’t produce as much saliva as other breeds so it is hard for these dogs to naturally clean their mouths. 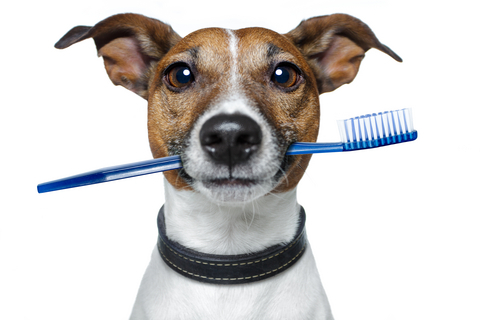 Take the time to brush your dogs teeth and introduce good dental products into their lives! Failure to do so can not only be bad for their health but bad for your check book, dentals are costly and are easily upwards of $300 without any extractions. This entry was posted in About IGs, ALL, Tips and tagged brush, brush dogs teeth, diy, dog, how to brush dog teeth, how to brush dogs teeth, how to brush my dogs teeth, how to brush your dogs teeth, teeth, why. Bookmark the permalink.